Otto Griebel visited the Königlichen Zeichenschule (Royal Drawing School) in Dresden, where he met Otto Dix. In 1912 he made drawings for the SPD (the German socialist party). During the First World War he served at both the Eastern and Western Front and there he met Otto Dix again. He returned severely wounded from the War, but during the Revolution of November 1918 he was able to take a seat in the Council of Soldiers in Dresden. In 1919 he joined the German communist party KPD and during the twenties he was member of several groups of left wing artists. In 1925 he married Grete Kliemann and during the same year he became friends with Joachim Ringelnatz. After the nazi's came to power he was frequently visited by the Gestapo. His work was removed from the museums and shown at the 'Entartete Kunst' exhibition before it was burned. In 1945 much of his work was lost during the bombing of Dresden. When the war was over he cooperated with the Russian forces. He held several positions as a teacher in Dresden and in 1965 his work was exhibited in that city. During the last years of his life more exhibitions followed in European cities. 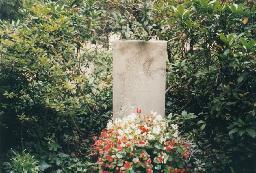 The grave of Otto Griebel at the cemetery in Dresden-Loschwitz.